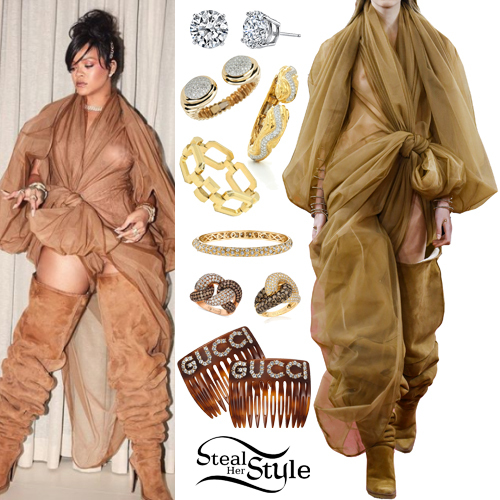 Rihanna was spotted leaving Kappo Masa Japanese restaurant in New York wearing the Y/Project Boxy Fit Blazer ($1.470.00), Callipgyan Bias Skirt ($195.00), Fendi Peekaboo Mini Crocodile Leather Bag (Not available online), Le Vian Necklaces (Not available online), a Cartier Panthère de Cartier Yellow Gold Medium Watch ($22,800.00) and Manolo Blahnik Paloma Snakeskin Sandals ($795.00). Jennifer Lopez was spotted out and about in New York wearing a Poiret FW18 Oversized Shirt ($2,010.00 – similar style), the Flawless Cross Pendant ($1,560.00) and a Personalize Necklace ($2,390.00) both by Lana Jewelry, Le Vian Earrings, Bracelet and Ring (Not available online), Chanel Shield Sunglasses ($1,150.00), the Hermès Shiny Niloticus Crocodile Birkin ($30,000.00 – preowned) and Versace Stella Buckle Boot ($2,695.00 – Sold out). Katy Perry appeared on American Idol: Peformance Finals wearing Elie Saab Spring 2017 Couture (Not available online), Spallanzani Star Aquamarine Earrings (Not available online) and Le Vian Rings (Not available online), with Katy Perry Collections The Goldy Sandals ($79.00).